My introduction to cancer along with the many variations and pathways through which it infiltrates our lives happened 25 years ago. It was a diagnosis of ovarian cancer, and it was discovered in my young wife at the time and during a period of our lives when we were fully engaged in our work, world travel and living in our first home. It was a period when everything seemed to be going right, but cancer often has a way of slipping through the cracks of lives that are fulfilled and tranquil. One of the highlights of our time together, and certainly of our careers as stage magicians, was backpacking around the world in 1989 and spending a year performing in scores of towns and villages. My wife and I carried our tent, sleeping bags and enough magic apparatus to present an hour-long show. There wasn’t a day that we didn’t look forward to donating a program to the many families we met along the way. In that year we visited more than 50 countries, but my favorite memory is of our 30 days in Nepal, hiking the 100-mile trail known as the Annapurna Circuit. While it was unclear to us during our expedition, this was also the time and place that the first murky symptoms of advanced ovarian cancer would appear. After obtaining our travel permits and being transported by jeep on a hair-raising drive through the steep mountain roads, many with sheer drop-offs, we arrived in the village of Pokhara. Then we set off on foot, and for the next month it would seem as though we were trekking on another planet since Nepal was very different from the world we knew. The tour was challenging, gratifying, grueling and most of all, life-changing. We met wonderful people, presented magic shows in nearly every village we visited, saw some breathtaking scenery and hiked over soaring mountain peaks. The highlight of the month-long expedition was a crossing of the Thorong-la pass. At just under 18,000 feet and not far from the border of Tibet, it’s the highest mountain pass in the world. 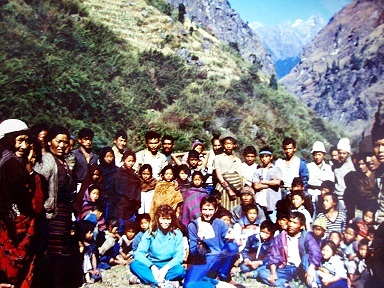 Often, we would walk all day and arrive in a small village with a hundred or so people sitting in a semi-circle, waiting for the show to begin. It turned out the Sherpas who carried supplies from village to village, also carried news that two magicians would be arriving soon. So, no matter how many hours we walked or how tired we were, we were always happy to present our program to the Nepali people the moment we entered their village. Needless to say, they treated us kindly. The last thing on our minds at that time was our health, but as our journey unfolded we were confronted with some disturbing symptoms. We both had contracted a dreaded traveler’s ailment called Giardia — it’s a microscopic parasite that lives in untreated water. In Nepal in 1989, outhouses were often built on small bridges directly over a river. This made for instant plumbing, but for any unlucky inhabitants downstream, it meant trouble. We carried water purifiers, but a piece of fruit or meal of rice and lentils could easily have given us the bug. The symptoms are great muscle weakness, diarrhea and loss of appetite. It was cleared up in me with some medication that we had brought along with us, having done the research on possible bugs that we might encounter. My wife, however, experienced a lingering illness. Our trip continued for another few months and when the year was over, we flew home to California. Back in the States, we had made a commitment to present a series of slideshows and lectures for some of the corporate sponsors who had helped to support our adventure and we did so with great enjoyment. At the same time, we became increasingly aware of my wife's difficulty with digestion and appetite. Not long after that, we moved to Oregon where the magic shows continued with tours to Alaska and Washington for the Oregon Museum of Science and Industry. My wife stayed home this time; her energy had diminished. The digestive problems persisted and we continued to think that the parasite she had contracted in Nepal was the culprit. We had been healthy and active all our lives and had no family doctor, but with my insistence she finally agreed to see a physician in Portland. We were sent home with antibiotics and a diagnosis of irritable bowel syndrome. More weeks went by until we detected that she was visibly bloated and increasingly uncomfortable. We went to see a gastro internist, who collected a sample of the fluid that seemed to be causing the swelling in her abdomen. Within 24 hours, the diagnosis was received: stage 3 ovarian cancer. My wife’s cancer preceded the discovery of the CA-125 blood test used today to detect ovarian cancer. Little was known about the disease, except for the serious threat it carried. We battled her cancer as a team for several years with many rounds of chemotherapy, surgery and clinical trials. In the meantime, we tried to continue our magical work with kids and families. We were even able to present a month-long magic tour in Japan with the approval and assistance of her oncologist who ordered all of her chemotherapy medications, drip lines and medical gear so that we could take it along with us. With the help of our Japanese hosts, we found a hospital willing to administer the drugs. This was to be our last opportunity to perform together. Then, back in Portland, we got the news that her cancer had metastasized to the lining of her lungs. There were more surgeries and still more chemotherapy. She lost the fight at the age of 47. During her illness, we often talked about how lucky we were to have been able to travel the world while we were still well enough to do so. More than a few of our family members had been alarmed by our willingness to sell our home, car and belongings before embarking on our journey. We never regretted our decision to go. Today, as the people of Nepal struggle after the devastating series of recent earthquakes, I think back on the beauty of the country and its inhabitants as we saw it more than 25 years ago. Out of all those destinations around the planet that we were lucky to visit, Nepal has always been the best in my mind. Somehow, the very real magic that we experienced there made the cancer journey a little easier to navigate. There is a majesty and breathtaking awareness of life on Earth that surrounds those who visit. Our time in Nepal, along with the memory of my magical partner, remains forever effervescent in my heart.